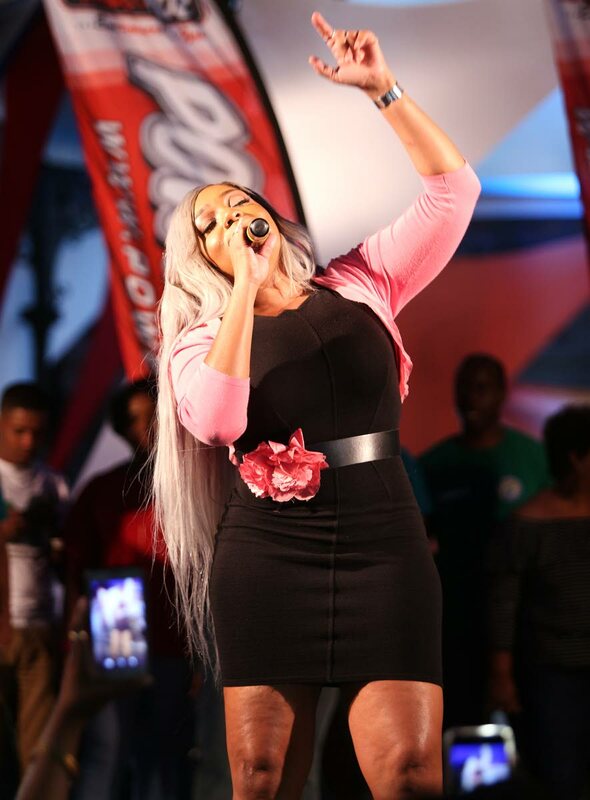 Destra Garcia performs at Woodford Square, Port of Spain after receiving the Downtown Carnival Committee award at the launch of the Downtown Carnival yesterday. The Queen of Bacchanal Destra Garcia was honoured by the Port of Spain City Corporation with the Downtown Carnival Committee Award for her sterling contribution to soca as she promotes this country’s culture here and abroad. She was presented with a plaque by deputy mayor Hillan Morean during the launch of downtown Carnival on Friday at Woodford Square where, despite walking with a limp after injuring her leg last year, gave an impromptu performance for her appreciative fans. Speaking with the soca artiste afterwards, Garcia said: “I feel excited. I feel honoured to be honoured. It’s a nice moment when a woman can be honoured in any genre of work, especially in soca where you have few women who really make a lot of noise. Despite having limited movement, Garcia said she would still be performing during the Carnival season. “I am limited in the amount of shows I can do. My doctor said I can attempt to jump in about three months and everything should go back to normal. There will be no climbing scaffolding unfortunately, but next year for sure,” she promised. During the launch, while there were many performers, there was no parade of traditional mas characters. According to chairman of Downtown Carnival Wendell Stephen, it was not economically feasible. “A lot of sponsors have pulled out like Digicel and Bmobile. Normally Digicel has been generous to us, but this year, for some reason or other, they did not come on board. NLCB (National Lotteries Control Board) finally gave us some money and we are still awaiting the Government subvention. It was a struggle this year to put this on but, we do this in conjunction with Power 102 and 94.1FM,” Stephen said. He said there was still hope for the public to be treated to traditional mas during downtown J’ouvert. Reply to "Destra honoured by PoS corporation"